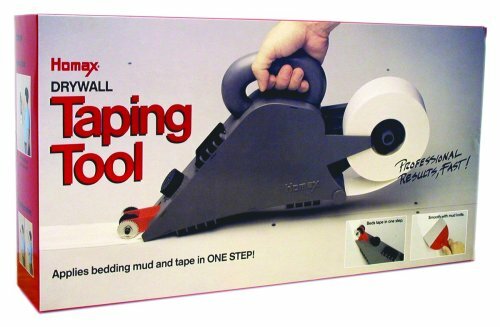 Drywall taping tools, or "banjos", as they are often called, are designed for DIY hobbyists and professional contractors to simultaneously mud and tape drywall seams. The users that we spoke with say that, in general, they can do the taping 3 to 5 times as fast using a drywall taper than by hand. You can also rent these tools- typically for around $10 a day- but many contractors and DIY-ers prefer to keep a spare one on hand in their garages. 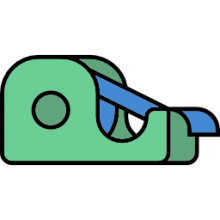 Novice users will discover that it takes a little bit of practice before you can use the tool effectively, especially in tight corners where the bulk of the taper makes it tricky to operate. However, once you get familiar with how it works it will make short work of covering drywall seams with paper tape. Speed is not the only advantage a banjo taper offers. It will actually eliminate the annoyingly common problem of loose or bubbling tape that irritates many beginning tapers. The Walboard quick-loading drywall taper was one of our favorite banjos. It can hold up to 500 linear feet of the drywall tape, with an adjustable mud flow dam in the front, and an easy to fill mud compartment. One novice user who hates taping drywall says that it is a well-made machine that was incredibly useful for his drywall taping project in his kitchen and bathroom. This reviewer told us that he liked that the tape came out of the taper totally coated on one side with mud, which meant that it wasn't a tremendously sloppy process to get the job done. As well, this reviewer we consulted applauded the construction of the tool saying that the stainless steel build was top-notch, making it easy to clean up and pretty simple to use. Let's take a look at five of the best-selling drywall taping tools on the market today and see how they compare. This drywall taper banjo offered by Delko Plastic is convenient, easy to use, practical and suitable for novices and professionals alike. Users love the inside corner adapter, but some do note that there are no clear instructions on how to use it. This drywall taper tool is made of high-quality plastic, and it has a mud adjustment knob for better control of the flow, a spare knob, and a nylon handle. It can hold up to 5 pounds of mud and 500 feet of tape, and you can use it to apply mud and the tape quickly and efficiently. 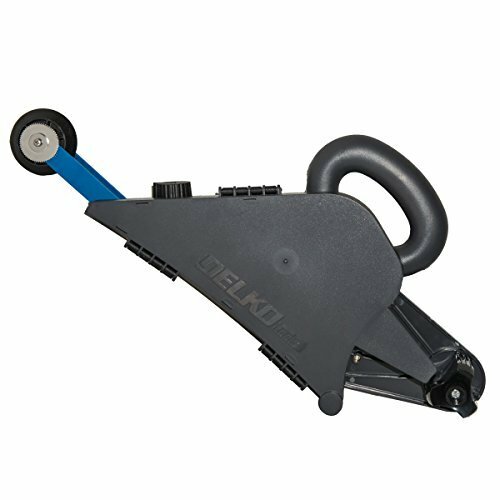 In general, users have a favorable opinion of the Delko Plastic drywall taper banjo. A buyer comments that this is an easy-to-use tool and he finds the inside corner adapter to be very useful. He would recommend it to anyone looking for an effective drywall taper. Another customer mentions that this drywall finisher puts mud evenly and doesn’t leave blisters. The user also states that he wishes that he has bought it sooner because it makes his job so much easier. However, some customers have complained that the tape would roll out without mud on it and that it doesn’t work as well as they hoped. Another purchaser also complains that he couldn’t achieve an even mud distribution and he was unhappy with the result. This quick load drywall finisher offered by Walboard Tools is well-built, durable and useful if you have a lot of taping to do. Users love the sturdy construction, but some do note that it’s heavier than they expected. This drywall banjo taper has a size of 27.2″ x 3″ x 11″, a weight of 4.3 pounds, a hinged mud compartment, an adjustable side strap, an adjustable mudflow, and a wooden top handle. The Walboard taper is made of rigid, lightweight aluminum and it can hold up to 500 feet of tape. In general, users have a very high opinion of this quick load drywall tool, and they praise its functionality and performance. A buyer shares that he managed to tape both his kitchen and bathroom in one day with the help of this drywall tapering tool, even though he is not a professional. The reviewer also states that he was extremely surprised by the high-quality construction and that he had no issues with the mud leaking out. Another customer comments that he taped his whole house with the help of the Walboard drywall taper and it’s still in remarkably good condition. He would recommend it to anyone looking for a top-rated drywall finisher. However, some have complained that when you load it, it can be heavy for horizontal or overhead work and that it’s not very easy to use it in tight corners. If you are looking for an efficient and inexpensive taping tool, you might take a look at the Homax drywall taper. Users love the price and the quality of the taper, but some do note that there is no tape cutting device on it. With a size of 19.5″ x 3.8″ x 3.2″ and a weight of 2.6 pounds, this drywall finisher tool has an adjustable mud control knob and tape tracking wheels. This drywall taper can hold up to 500 feet of tape, five pounds of mud, and you can apply 60 feet of tape and mud in 60 seconds. A buyer comments that he is not a professional drywall taper, but he has no problems to use the Homax drywall banjo, and it works flawlessly. He would recommend it to anyone who has never taped before and wonders which taper to choose. Another user mentions that the tape rolls smoothly and that he achieves a consistent mud layer with this taping tool with ease. A happy purchase shared that he was shocked by the results he achieved with this taping banjo because he was able to completely seal all the corners in his basement in about two hours. However, customers have complained that the adjustment mud knob arrived broken or that it breaks too easily. Some also state that it’s not good for corners and that you have to thin the mud considerably before you use the Homax taper. The Marshalltown drywall taper tool is well-constructed, efficient, and useful for your do-it-yourself project. Users love the comfortable, sturdy design, but some do note that it’s overpriced. 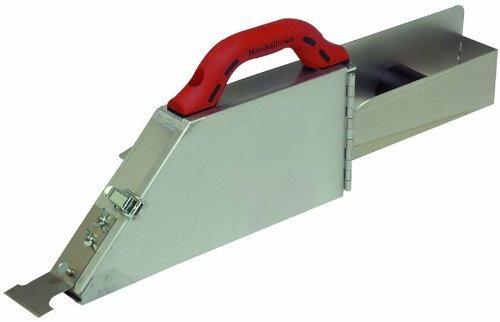 This drywall finisher has a size of 24.9 x 3.7 x 9.9 inches, a weight of 3.6 pounds and it’s made from lightweight aluminum. This tape shooter tool has adjustable mudflow, a latched door on the tape holder, an adjustable web side handle with thumb rest, a comfortable handle and a serrated cut-off blade. You can easily load the taper with only one hand, but you should be aware that this tool is suitable for right-handed users only. A buyer comments that he has been using this drywall taper banjo for two years with multiple tapes and he has encountered no problems. He would recommend it to anyone looking for the best drywall tape shooter. Another reviewer mentions that the handle is soft and he can use it for long periods of time without tiring. The user states that it works perfectly for corners, but the cutting blade is not very sharp. A happy purchaser also shares that it’s very easy to figure out how to use this drywall banjo even if you are a novice, and it has saved him countless hours of hand-taping. However, customers have complained that the quality is not what they expected. One user complains that this taping banjo leaks mud constantly and it doesn’t handle the tape as it should. This Kraft drywall taper with wood handle is convenient, well-built and practical. Users love the lightweight construction, but some do note that it’s expensive. The Kraft drywall finisher has a size of 27″ x 3″ x 5″, a weight of 2.9 pounds, and it’s made from lightweight aluminum. It has 2-inch adjustable web side handle with thumb rest and the capacity for 500-feet tape roll. Overall, this is a taping tool of high-quality and price, but it’s suitable only for right-handed users. In general, users have a very favorable opinion of the Kraft drywall taper with wood handle, and they praise its performance, functionality, and usefulness. A buyer mentioned that he was skeptical at first about this drywall banjo, but it performed beyond his expectations, and he would gladly recommend it to anyone looking for a top-rated drywall taper. Another user shares that this taper was delivered fast and in good condition, and he has been using it for weeks without any major problems. However, some customers have complained that the banjo isn’t performing as well as they expected. A dissatisfied user mentions that the spool tape holder was poorly assembled and mounted off-center, so he returned the taper without using it. The Delko Plastic Drywall Taper was one of our favorites- it is a 1.76 lb. tool that features a banjo-style build for added durability & ease-of-use. In addition, the manufacturers have been handled construction to make it easier to use. As well, it ships with flat and internal corner applicators to make drywall taping as easy as possible. Users, in general, are satisfied with this drywall taper, saying that it is a quality tool, working as advertised, easily enabling drywall taping without blistering your hands. It's definitely best to watch some instructional videos before starting to tape that way you don't overload the taper with mud and create a mess. On the downside, another reviewer we interviewed said that if you load it up with too much mud and are trying to do overhead work it becomes a little bit cumbersome to use. There is definitely a learning curve with drywall taping, with some users saying that working in tight spaces takes a little bit of practice to perfect. A professional home renovator commends the wallboard drywall taper, saying that it is similar in quality to the tools he has used professionally on construction and home-repair sites. The Homax 6500 drywall taper was another option we examined- the manufacturers claim that it is able to apply 60 feet of tape and mud within 60 seconds. One novice user that we spoke to said that he was easily able to get this taper up and running for long and straight areas, but he had some trouble getting up to work in tight, corner areas. Overall, though, he said that using a drywall taping tool saves him a ton of time as opposed to doing it by hand. In addition, he does say that, yes, it is messy to refill the device but that is to be expected when you are taping drywall. Another buyer said that he can tape 4x as fast using a drywall taping tool as opposed to doing it by hand, but he does say that this particular tool is a little bit too delicate- one drop from a ladder would certainly destroy it. Another reviewer we spoke to says that initially he thought the inside apartment for the mud would be too small, but once he filled it up he realized that it had a fairly large capacity and was actually quite heavy once he began using it. The majority of buyers that we spoke to seem to intensely dislike the process of drywall taping, and they were all pretty eager to discover a new solution that made it faster and easier to do. The Marshalltown Tapeshooter was another option that we examine that received mixed feedback. One of the contractors that we spoke with says that he's been using it for over three years now without any trouble. He says that it cleans really easily, that the tape feeds and cuts well, and it is a comfortable grip in his hand. Other reviewers we interviewed said that they had apparently received a defective model with an inside plate that was not correctly drilled and would not fit. This user had to go the extra distance drill holes wider to get a fit. Another reviewer that had a negative experience told us that he thought the price was too high, especially when he experienced excessive mud leaks using it. However, another buyer that we spoke with said that it worked perfectly for taping corners, though he said that he thought the tape cutting blade near the front of the drywall taper should be a little bit sharper. The Kraft DC401 tape shooter was the final option that we examined- it is made for right-handed users, constructed from aluminum, and has the capacity for 500-feet rolls of tape. The majority of users we spoke with said that it was a solid option, although one buyer complained that it came to his door poorly assembled with an off-center mount. If you are in the market for a drywall taping tool, check out our reviews on this page, and even watch some YouTube videos to get a sense of how best to use the taper you end up purchasing.